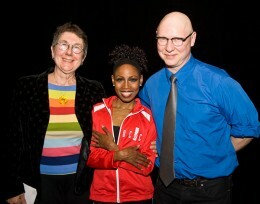 Retired Wright State film professor Julia Reichert (left) and motion pictures alumnus Steven Bognar (right) pose at their film's Dayton premiere with DCDC dancer Sheri "Sparkle" Williams. Sparkle, a short documentary by celebrated Wright State filmmakers Julia Reichert and Steven Bognar, will be shown on national television early next year. The film will air on PBS at 9 p.m. on Feb. 7 as part of as part of the network’s new series, Lifecasters. Jennifer Lawson, senior vice president of television and digital video content for the Corporation for Public Broadcasting, announced Sparkle’s television debut at the film’s Dayton premiere. Held at the Dayton Art Institute, the evening included performances by Williams and DCDC, as well as a question-and-answer session with the filmmakers. Creating this documentary was no easy task. With a crew composed mostly of Wright State film students and alumni, Reichert and Bognar followed Williams through her months-long recovery process. The film offers audiences a rare behind-the-scenes look at DCDC’s rehearsals and performances. The longevity of Williams’ career is unusual in the world of dance. The 50-year-old dancer joined DCDC in 1973. A native Daytonian, Williams has received numerous awards throughout her career including the JOSIE Award, Fisk University’s Excellence in Artistry Award, a Lifetime Achievement Award from the Montgomery County Arts and Cultural District and the coveted New York Dance and Performance Award (the Bessie). Bognar said that the film depicts Williams and her DCDC company as a family of caring, fun people who are not only great performers, but also exceptionally hard workers. Earlier this year, Sparkle won the Audience Award for Best Short Documentary at SilverDocs, the largest documentary film festival in the United States.